The Greater Macon Chapter of USA Dance #6059 is a part of the National organization USA Dance. The National Organization promotes ballroom as a recognized sport and a recreational activity, providing opportunities to all Americans. Objectives include: Educating the general public on how ballroom dancing as a sport or activity enhances the physical and mental well-being and health of its participants, regardless of age, ability or interest level; also about the social benefits of participating in organized dance from preschoolers to seniors. USA Dance fosters and promotes a willingness and spirit of universal cooperation among the co-existing dance, sports and social organizations, to sustain a high level of interest and participation in ballroom and Latin dancing. USA Dance provides a means of information exchange between the various dance related organizations and promotes healthy and productive interactions between dancers of all organizations, elimination restrictive conditions and policies that would prohibit or discourage dance and to promote and guide social and competitive ballroom dance programs at the collegiate and k-12 levels throughout the nation while fostering and helping sustain USA Dance chapters in all 50 states. 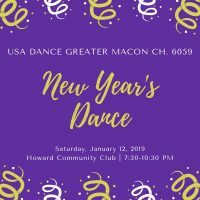 Our purpose as a local chapter is to promote ballroom dancing in the local community and to educate the public regarding the physical, mental, and social benefits of ballroom dancing. Our chapter welcomes beginner dancers and helps them get started in ballroom dancing. Talented dancers are encouraged to become Dance Sport Athlete competitors. Our chapter promotes and sponsors amateur ballroom dancing for competitors, social dancers and the general public. We work toward the recognition of ballroom dancing as an art form, a lifetime recreational activity and an Olympic sport. 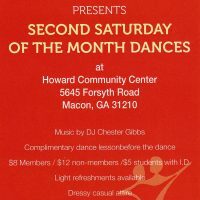 The Greater Macon Chapter strives to bring the joy and benefits of ballroom dancing to as many people as possible. 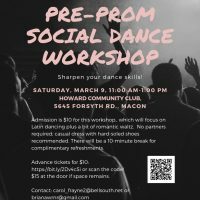 The Chapter creates dance opportunities for local citizens by organizing affordable social dances, dance lessons and workshops. Chapter members often present dance education and live demonstrations in nursing homes, retirement facilities, hospitals, schools shopping malls and other public venues while striving to educate the public regarding the health and social benefits of ballroom dancing. 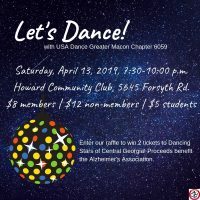 The goal of the chapter is to serve the national mission on a grassroots level , as a leader and a motivation for ballroom dance activities in the community for which it serves. 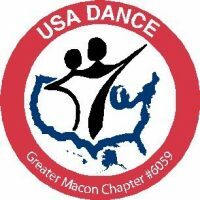 USA Dance is organized and operates exclusively for charitable and educational purposes. It is approved by the Internal Revenue Service as a Section 501 Nonprofit Organization.